The review chapters in this volume were the basis for a short course on sulfate minerals sponsored by the Mineralogical Society of America (MSA) November 11-12, 2000 in Tahoe City, California, prior to the Annual Meeting of MSA, the Geological Society of America, and other associated societies in nearby Reno, Nevada. The conveners of the course (and editors of this volume of Reviews in Mineralogy and Geochemistry), Alpers, John Jambor, and Kirk Nordstrom, also organized related topical sessions at the GSA meeting on sulfate minerals in both hydrothermal and low-temperature environments. Sulfate is an abundant and ubiquitous component of Earth's lithosphere and hydrosphere. Sulfate minerals represent an important component of our mineral economy, the pollution problems in our air and water, the technology for alleviating pollution, and the natural processes that affect the land we utilize. Vast quantities of gypsum are consumed in the manufacture of wallboard, and calcium sulfates are also used in sculpture in the forms of alabaster (gypsum) and papier-mache (bassanite). For centuries, AI-sulfate minerals, or "alums," have been used in the tanning and dyeing industries, and these sulfate minerals have also been a minor source of aluminum metal. Barite is used extensively in the petroleum industry as a weighting agent during drilling, and celestine (also known as "celestite") is a primary source of strontium for the ceramics, metallurgical, glass, and television face-plate industries. Jarosite is a major waste product of the hydrometallurgical processing of zinc ores and is used in agriculture to reduce alkalinity in soils. At many mining sites, the extraction and processing of coal or metal-sulfide ores (largely for gold, silver, copper, lead, and zinc) produce waste materials that generate acid-sulfate waters rich in heavy metals, commonly leading to contamination of water and sediment. Concentrated waters associated with mine wastes may precipitate a variety of metal-sulfate minerals upon evaporation, oxidation, or neutralization. Some of these sulfate minerals are soluble and store metals and acidity only temporarily, whereas others are insoluble and improve water quality by removing metals from the water column. There is considerable scientific interest in the mineralogy and geochemistry of sulfate minerals in both high-temperature (igneous and hydrothermal) and low-temperature (weathering and evaporite) environments. The physical scale of processes affected by aqueous sulfate and associated minerals spans from submicroscopic reactions at mineral-water interfaces to global issues of oceanic cycling and mass balance, and even to extraterrestrial applications in the exploration of other planets and their satellites. In mineral exploration, minerals of the alunite-jarosite supergroup are recognized as key components of the advanced argillic (acid-sulfate) hydrothermal alteration assemblage, and supergene sulfate minerals can be useful guides to primary sulfide deposits. The role of soluble sulfate minerals formed from acid mine drainage (and its natural equivalent, acid rock drainage) in the storage and release of potentially toxic metals associated with wet-dry climatic cycles (on annual or other time scales) is increasingly appreciated in environmental studies of mineral deposits and of waste materials from mining and mineral processing. 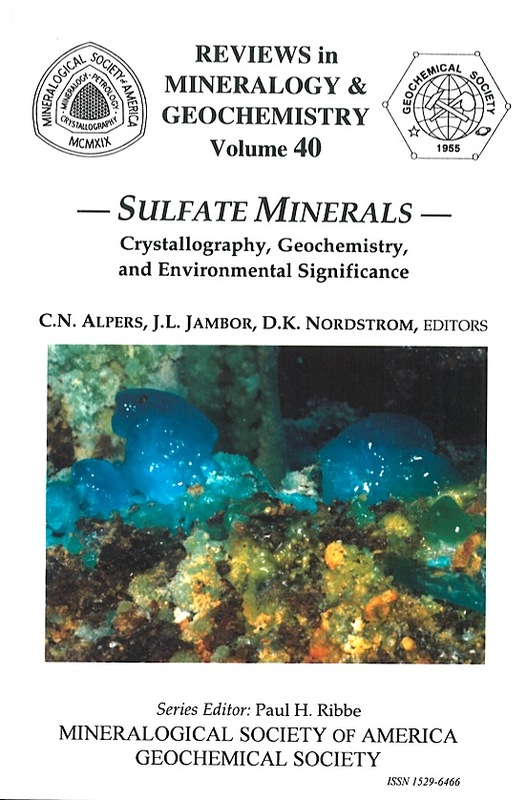 This volume compiles and synthesizes current information on sulfate minerals from a variety of perspectives, including crystallography, geochemical properties, geological environments of formation, thermodynamic stability relations, kinetics of formation and dissolution, and environmental aspects. The first two chapters cover crystallography (Chapter 1) and spectroscopy (Chapter 2). Environments with alkali and alkaline earth sulfates are described in the next three chapters, on evaporites (Chapter 3), barite-celestine deposits (Chapter 4), and the kinetics of precipitation and dissolution of gypsum, barite, and celestine (Chapter 5). 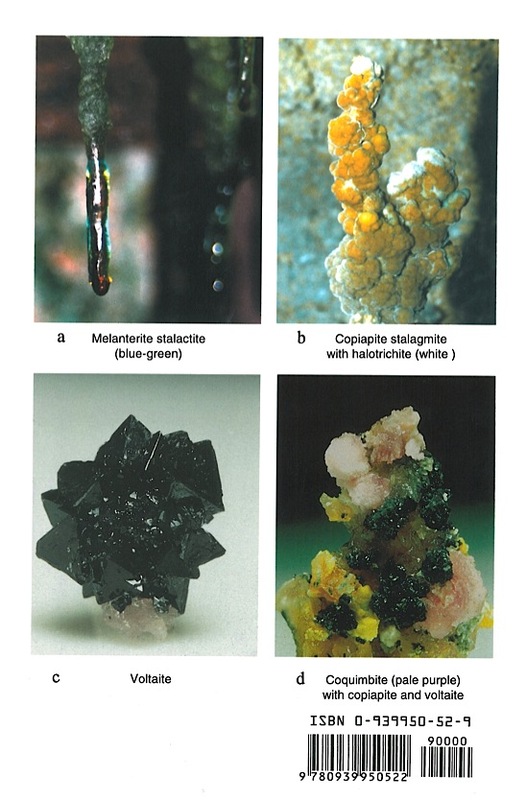 Acidic environments are the theme for the next four chapters, which cover soluble metal salts from sulfide oxidation (Chapter 6), iron and aluminum hydroxysulfates (Chapter 7), jarosites in hydrometallugy (Chapter 8), and alunite-jarosite crystallography, thermodynamics, and geochronology (Chapter 9). The next two chapters discuss thermodynamic modeling of sulfate systems from the perspectives of predicting sulfate-mineral solubilities in waters covering a wide range in composition and concentration (Chapter 10) and predicting interactions between sulfate solid solutions and aqueous solutions (Chapter 11). The concluding chapter on stable-isotope systematics (Chapter 12) discusses the utility of sulfate minerals in understanding the geological and geochemical processes in both high- and low-temperature environments, and in unraveling the past evolution of natural systems through paleoclimate studies.